Gene Zubovich is a Postdoctoral Research Associate at the John C. Danforth Center on Religion and Politics at Washington University in St. Louis. He earned his Ph.D. in history from the University of California, Berkeley, and comes to Washington University in St. Louis from a teaching position there. He specializes in the history of the twentieth century United States, with interests in human rights, religion, and international history. 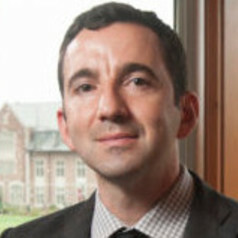 His academic work includes a forthcoming book on religion and international affairs with the University of Pennsylvania Press and a forthcoming article in the Journal of American History titled "Against Imperialism Abroad, Against Jim Crow at Home: The Political Mobilization of American Ecumenical Protestants in the Era of World War II." His non-academic work has appeared in Aeon, Religion and Politics, and The Christian Century.